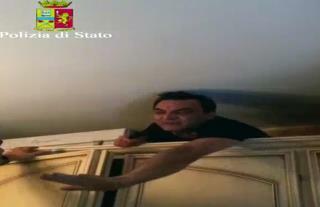 (Newser) – One of Italy's most-wanted fugitive mob bosses was arrested after five years on the lam Wednesday when police found him hiding in a home bunker built between the bathroom and his son's bedroom. Antonio Pelle, 54, crawled out of his hiding place on his stomach to the top of an armoire that had shielded the bunker at his home in southern Reggio Calabria, the AP reports. Video of his surrender showed at least two dozen police officers surrounding the wardrobe waiting for him to emerge. Pelle is considered the boss of the Pelle-Romeo clan of San Luca, which is part of the Calabrian 'Ndrangheta mob. Some mob boss; hiding in a closet.. I am sure his street name "mamma" will go over great in prison at lights out - Oh Momma Mia..